How Long Does It Take to Install a Garage Door Opener? How Long Will It Take Me to Install a New Garage Door Opener? How long it takes to install a garage door opener depends on a few factors, but you should count on at least half a day, or about 4–6 hours. It's one of those jobs that takes a lot longer to do the first time because you have to become familiar with all the parts and peculiarities of the specific model of the opener. If you happen to be installing more than one opener, the second one may take you about half the time than the first. The half-day time estimate assumes that you have a suitable electrical outlet installed in the ceiling of your garage. Most openers need a grounded outlet within a couple of feet of the motor unit, and you cannot connect the opener using an extension cord. One of the biggest factors determining how long it takes to install a garage door opener is whether you're replacing an old opener or installing a new unit where there is no existing opener. If you're replacing an old opener with a similar type of new opener, you can likely reuse the existing supports that hold the motor unit as well as the wood blocking for the bracket above the door. However, don't try to save time by reusing electrical components, such as the safety sensor "eyes" or any wiring. The new electronics are likely to be more effective than the old devices, and they're designed for use with the new opener. Old wiring may have worn, damaged, or brittle insulation and should be replaced. Take inventory. Although most of us ignore the assembly instructions when they tell us to look through and sort all the parts before assembly, it's a good idea to do so in this case. Assemble the rail. Rails come in five or six pieces that slot together; assembly usually includes the trolley that connects to the door and moves along the rail. Fasten the rail to the motor unit. Install the chain, including the idler pulley on the door end of the track. The chain is only a little longer than the rail; it's not continuous, like a bicycle chain. A cable completes the chain loop and passes over the idler pulley on its way back to the motor unit. Install the header bracket support. This is a 2x4 or larger piece of lumber that anchors to the framing above the door and supports the door end of the track. Hang the opener. The motor unit mounts to the garage ceiling with two or more pieces of angle iron. The rail mounts to the header bracket support via the header bracket. Install the door bracket and arm. The arm is the L-shaped metal bar that attaches the door to the trolley on the rail. Add the electronics, including the door button and safety sensor "eyes." 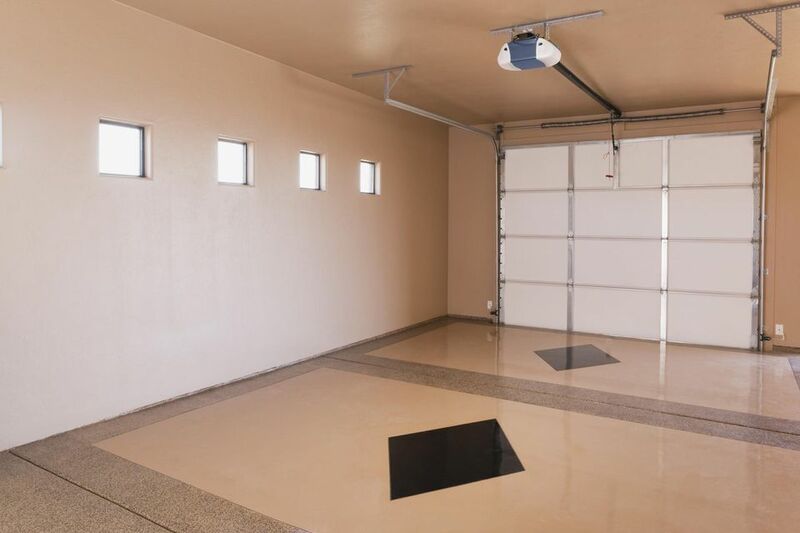 The wiring is low-voltage and can simply be stapled to the walls and ceiling of the garage. Program the opener for proper door travel. Test the opener's safety systems. Make sure the door is balanced before installing the opener. A properly balanced door will support itself and won't move if you open it about halfway and let go. A door that's out of balance is hard on the opener and can be dangerous. Have your door balanced by a pro if necessary. If you're replacing an existing unit, leave it in place until you're ready to mount the new opener. It will come in handy as a visual reference for how everything fits together. Set the motor unit on a tall stepladder when it's time to mount the unit to the ceiling. Add blocks to the ladder as needed, so the motor is in the desired position, then measure for the angle iron supports.